Varkala beach sits beneath the red cliffs, a strip of fine, golden sand licked gently by the warm waters of the Arabian Sea. Popular for decades now with travellers, the place still manages to maintain its low-key, relaxing ambience. As the sun goes down, sunbathers trickle slowly away from the beach up to the restaurants and cafes on the clifftop, where the fresh 'catch of the day' is being served. Look for dolphins Many cafes on the cliff have upstairs seating, giving a great view of a huge expanse of sea! It is the perfect place to look out for dolphins - we saw them on a number of occasions, once a pod of fifteen or so! Visit the temple Varkala is principally a temple town, its Janardhana Temple is on Beach Road at Temple Junction. Though it is closed to non-Hindus, it is worth visiting, and you may be able to enter the grounds. There is a small cafe/shop with a couple of outside tables near the temple where the cold drinks tasted particularly good. Explore the coast Walking in a northerly direction across the cliff you soon leave behind the stalls and cafes as the path continues along the headland and beside quiet beaches that are like an endless golden chain. Accommodation is sparse and pricey, there is the odd cafe... about an hour from Varkala cliff is perhaps the most beautiful beach in the world! Go to town Catch a bus into town from Temple Junction and get a taste of a Keralan town. The streets here are usually fairly quiet, and there are some great cheap places to eat and try traditional Keralan food. Ayurvedic treatments / yoga Ayurvedic treatments are big business in Kerala, and Varkala is no exception. Try Dayana on Beach Road (women only) or Eden Garden (just off Beach Road) for qualified masseurs. Yoga courses and taster sessions run from many guesthouses on the cliff top and cost around R.300 an hour. Varkala town and train station are about 2kms from Temple Junction which is at the end of Beach Road. Follow this road to Varkala beach. Facing the sea, Varkala cliff is to your right. Steps from here lead past some small shops to the clifftop. A large carpark/helipad must be crossed to get to the main restaurants, shops and accommodation on the cliff. Alternatively you can walk along the length of Varkala beach to the steps at the far end. Taxis/rickshaws can drop you at the carpark/helipad if you have heavy bags! Varkala is well connected by train, and Trivandrum (Airport TVR) is only one hour away. It is possible to get a train here all the way from Mumbai. 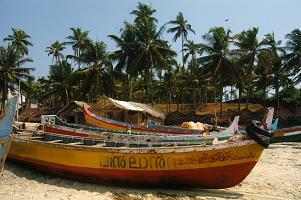 Kollam, Alleppey and other backwater towns are also accessible by train. Tickets can be acquired at the train station or the many travel agents along the cliff. From the train station, rickshaws will take you to the helipad or Temple Junction, but the drivers sometimes overcharge, and they almost certainly will want to show you their 'friend's hotel.' A bus goes from the station to Temple Junction. Can you recommend any great Varkal hotels? If you know of somewhere truly special or have any questions to ask, submit an entry to our forums! Walking to the end of the cliff top with a rucksack on, you will recieve many accommodation offers. Decide what you want to pay, and have a look at a few. Cheaper deals can be negotiated for longer stays, and prices are rarely 'fixed.' At the end of the cliff, a road turns right - follow this for some 'inland' homestays. There is no shortage of accommodation in Varkala, so take your time to find somewhere nice! The cliff top is the best place to enjoy views of the sea while you have your meal. Wander along at sunset and take your pick. These are the ones we particularly enjoyed. Trattoria Cafe Excellent breakfasts and great Thai food, this busy restaurant is spread out over three floors. We ate in the dark due to a power cut (common in Varkala) but this only seemed to add to the atmosphere. Sea Queen Exceptional food from a multi-cuisine menu, hand pick your fish or try the Mexican dishes which are huge and yummy. Oottupura Vegetarian Restaurant Always busy, serves inexpensive Keralan breakfasts as well as lunch and dinner options. Sreepadman Not on the cliff top but near the Janardhana Temple, this place does cheap dosas and thalis with a view of the temple tank (pool of holy water used for cleansing). Authentic food, popular with locals. Rickshaws can easliy be caught from the helipad/carpark at the top of the cliff. There are usually a few at the small car park behind Varkala beach. There is an ATM at Temple Junction, but it apparently does not take all cards. If you have no luck you can try in Varkala town or change money/traveller's cheques at any number of currency converters on the cliff top. There is a post office at Temple Juntion on the corner of the Janardhana Temple tank. Dress modestly when in town or around the temple. Shopkeepers / hotels / money changers / restaurants / rickshaw drivers are all competing to make a sale. If someone 'pounces' on you with an offer you are not interested in, politely but assuredly say no. Be aware how quickly the south Indian sun can burn, and take suncream/shelter! 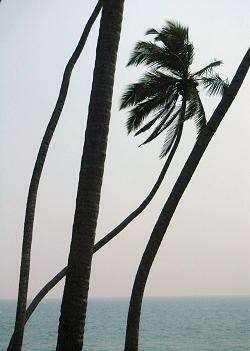 There can be very strong currents at Varkala beach. We would advise never to swim if you're drunk. After dark, perhaps stick to the cliff top as oposed to the beach, especially single travellers. 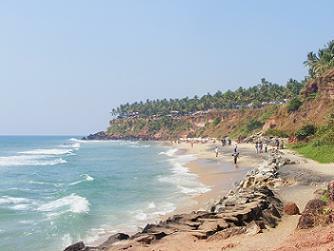 Varkala beach is popular with tourists from all over the world but usually manages to feel fairly quiet! 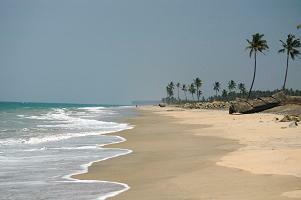 If, however, you like your beaches deserted, have a look at our sections on Kappad Beach and Thalassery.